Product code: T446 Categories: Sold Items, Sold Rings. So elegant and regal, this platinum Art Deco diamond engagement ring dating from the 1920’s sits perfectly on the finger and has such an elegant style to it that has never gone out of fashion or style. Art Deco engagement rings of the 1920’s are arguably the most popular today and the most common style that is reproduced, and when you see this one on your finger it will be so easy to see why. Entirely hand made in platinum, this was the precious metal of choice during the Art Deco era, as it is the purest of all the metals used in jewellery and allow for such fine detail as can be seen from the side. Sitting in the centre is a vibrant European cut diamond that measures 1.36 carats and is L in colour and very clean being VVS2 in clarity. The charm and character from a genuine antique cut diamond that has been cut by hand all those years ago adds so much more to an already very beautiful ring. The band has recently been remade by our jewellers in platinum in the exact way as the original, making this a ring that can be put on and left on for many years to come with no concern. With the most beautiful work on the setting of the diamond, this is a gorgeous Art Deco diamond engagement ring that will always be loved and admired. Set with a genuine antique European cut diamond and entirely hand made in platinum. 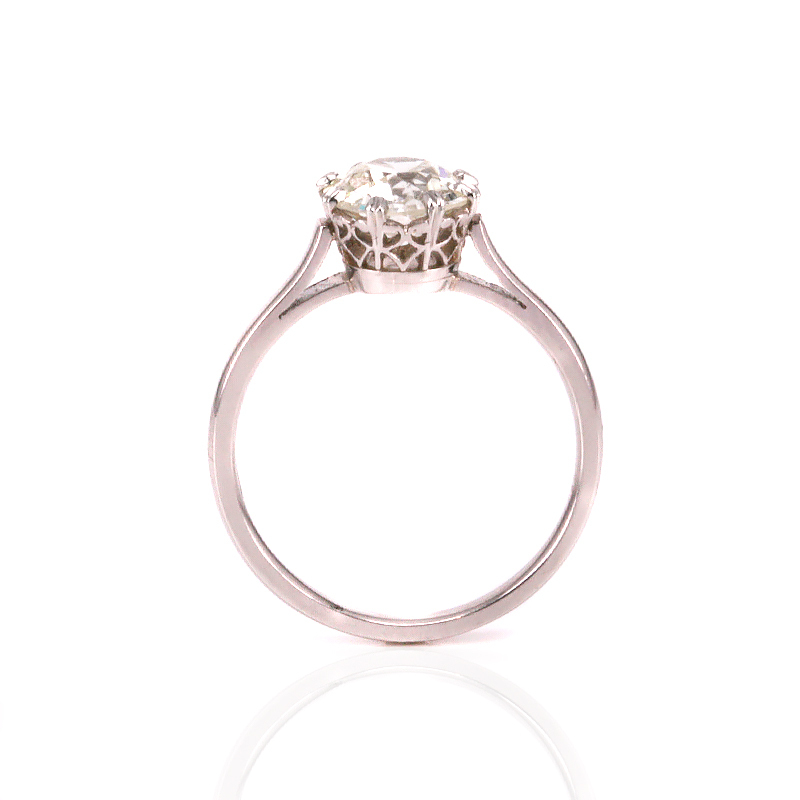 This Art Deco diamond engagement ring is so elegant and in a style that will never be out of fashion.